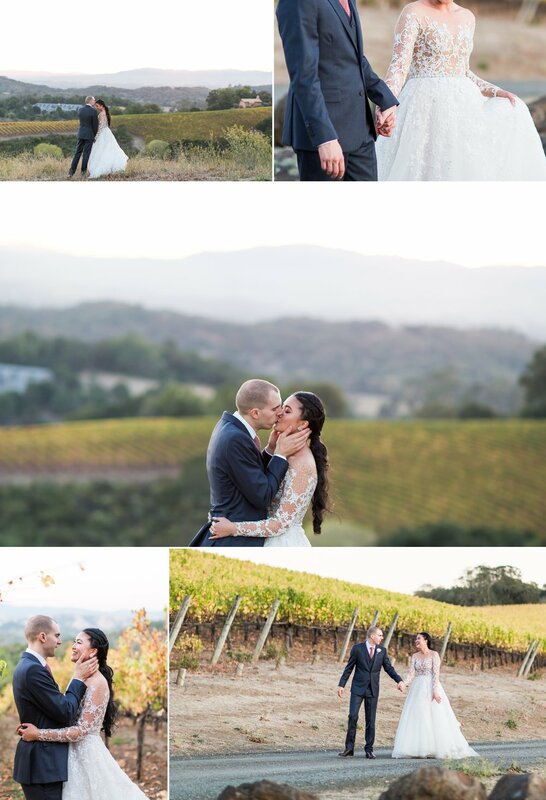 Elaine and Ben got married at Chalk Hill Estate & Winery last October and it was absolutely breathtaking. The vineyards had turned to vibrant hues of orange, yellow and red. The weather was perfect, and Elaine's attention to detail was impeccable. From the gorgeous paper goods by Union Street Papery to the draping linens from La Tavola, this wedding was beautiful. Revel Floral created a chandelier masterpiece from greenery and eucalyptus, along with stunning arrangements all around. All of the table names were Game of Throne Houses and the bride's hair was done up just like you see Daenerys Targaryen rocking it on the show. It was such a fun twist to a more classic, elegant feeling wedding! Per usual, my favorite part of the day was our golden hour session on the ridge, overlooking the rolling hills and autumn vines. I hope you enjoy this unique, stunning wedding as much as I did! All vendor credits are at the end of the gallery!